This photo is from my personal collection. It shows several of the Rhoads family men of Cambria County, Pennsylvania that are in my family tree. It came from the collection of my great grandmother, Ida Rhoads Sears (1900-2002). I am not sure when, but Ida identified the people in the photograph in her own handwriting on the back. 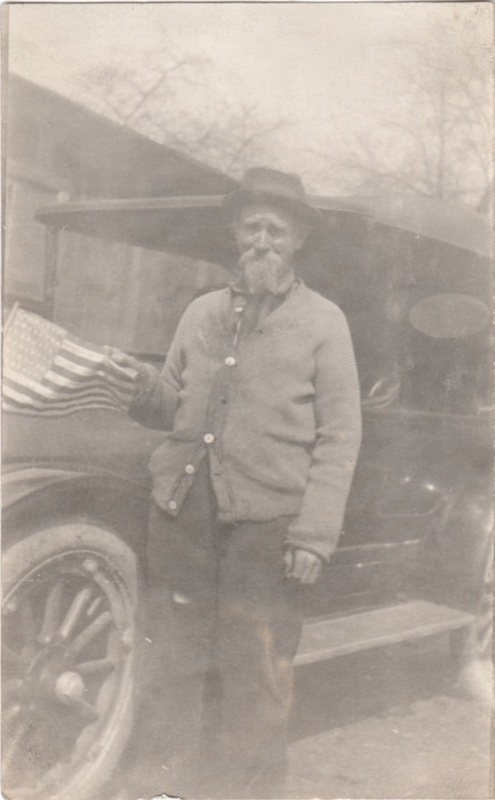 “My Dad” appears to be John M. Rhoads (1852-1919). He is the man on the far left and he is my 2nd great grandfather. “His Brother George”, wearing the fedora hat, is likely George W. Rhoads (1868-1929), my 3rd great uncle. George married Jennie Kring Rhoads (1871-1949) of the equally large and prominent Kring family in these same parts of Pennsylvania. “His son” is a bit more confusing. I believe it refers to the young man in the very back. I believe this is George’s son, Clarence O. Rhoads (1893-1964). Clarence is my 1st cousin 3x removed. “Then Dad” refers to the man sitting, Rhinard Rhoads (1833-1920). He is my 3rd great grandfather and the father of both John and George in this photo. “Uncle Joe Costlow Mother’s Brother” refers to the man on the far right, with suspenders and a pipe. Joseph Costlow (1855-1932) would be my 3rd great uncle. He would be John Rhoad’s brother-in-law. “Jack Stevenson” I believe refers to the man wearing the baseball type cap. This is likely John H. Stevenson (1878-1957). He was married to John Rhoads’s daughter, Della Rhoads Stevenson (1880-1964). Della is my 2nd great aunt. As you can tell, even with decades old handwriting on the back of photos you still have to do some sleuthing. It isn’t always clear which person the writing is referring to. There are often mistakes that you need to correct. I’ve crossed referenced these photos with some others that I have. Using those and the approximate ages of the people in this photo I think this is accurate. My best guess is that this photo was taken some time between 1910 and 1919 (the year that John Rhoads died). Here are a couple of other photos I have identified you can use to cross reference. And here is the woman at the center of it all, my great grandmother Ida. You can see her parents behind her. Joseph Costlow (1855-1932), a lifetime bachelor of Cambria Count, PA, was my 3rd great uncle. He died, seemingly alone, from complications of his alcoholism. This is his story. Ellen Amelia (George) Malzi (1866-1961) married John August Malzi (1865-1899) in 1891. She was widowed young, two months before their last child was born. Pictured here is Ellen, husbandless, with her 4 surviving fatherless children. Here are her stories of tragedy and strength. John Edward Campbell (1892-1959) and Maryann Rukamp. "Uncle Ed" was the husband of my 2nd great aunt Amanda Alice (Rhoads) Campbell (1895-1988). She was the sister of my great grandmother. Societal taboos about suicide often leave the stories of those who take their own lives untold. Here is the story of my 2nd great uncle, John Rhoads (1886-1922). "From Sea to Shinning Sea: The Kring Family" - By Sandra Kring Leonard. Here's the story of how I discovered my connection to the Krings of Pennsylvania.